As Arvigo® Self Care Teacher, interning to grow into the advanced teacher role, I organise & teach several Self Care Trainings every year, locally and internationally. I am also very happy to help and share this knowledge and I contribute helping organising and translating other Arvigo® Trainings. If you want to help me spreading the Arvigo® Techniques of Maya Abdominal Therapy please contact me. ​All the Arvigo® Trainings are listed in the official website www.arvigotherapy.com. A time of Empowerment... | This workshop is designed to educate and empower YOU to use your own two hands to help yourself! The Self Care - Level 1, is the first of 2 levels ATMAT practitioner. No specific qualification is required, this workshop is open to any person who desires to take good care of themselves or become a qualified ATMAT practitioner. Arvigo® Therapy is founded on an ancient Maya technique of a non-invasive, external abdominal massage. Arvigo® Therapy stimulates circulation and blood flow within the abdominal area, supporting the body for optimal function of digestive and fertile health and wellness. It is a therapy that can be applied throughout every stage of a woman, man or child life. Being taught how to massage your own abdomen is truly empowering. By doing your Self Care massage regularly you carry the benefits long after the class. You feel more in control of your wellbeing and you are physically and emotionally connected to your body-mind-energetic system. 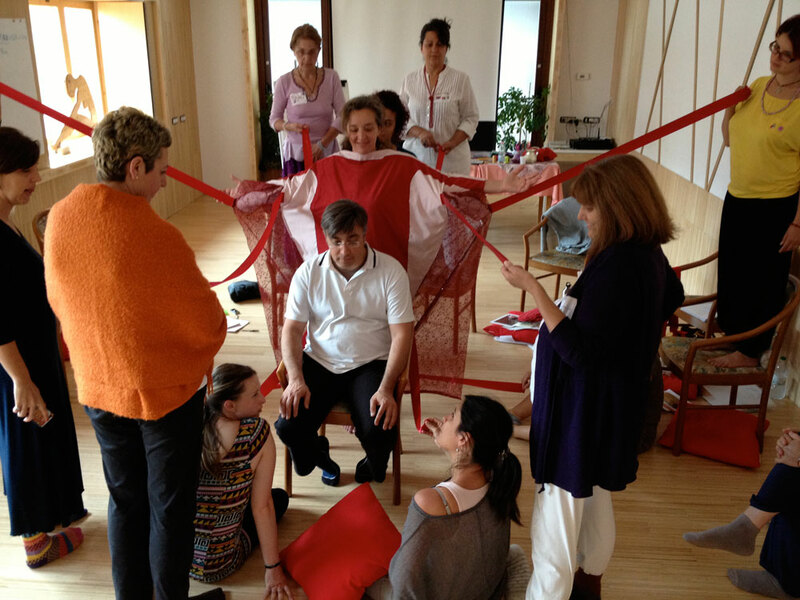 This workshop not only teaches the Ancient Maya heritage of abdominal massage, why and how to look after your abdomen, guided meditation and lifestyle suggestions but most importantly it offers you the chance to reconnect to an often neglected area of the body, often offering insight into personal conditions and situations experienced. Challenging menopausal symptoms........the list goes on. Then join us on this journey of discovery into the workings of your body, gain an insight into the conditions that contribute to a failing in health and vitality. Leave with a deepened understanding of what you can do to support your own bodies’ innate healing mechanisms and confidently perform your Arvigo® Self Care Massage routine. This training is required to access the Arvigo® Professional Care Training as we believe that a good practitioner is the one who is taking care of oneself & who has gone throng the same path that is also proposed to the clients. Do you want to organise a class closer to you? Contact me! During the class you will learn how to treat your client’s (or patient’s) abdomen. With a gentle, non invasive and external sequence of inspired movements you will be able to facilitate the blood, lymph and nervous system circulation, not to mention the energetic system, that in some cultures they call Prana, Chi, in this case we call it Chul’el. By keeping these 5 flows flowing you are enhancing the natural balance of the body, also known as Omeostasis. You will learn how to relax the abdominal muscles, reducing pressure from the internal organs; ultimately you will master how to support the digestive and reproductive systems which are the key to your client’s general well being. This course applies a multi-system approach (anatomy and physiology, lymph, circulatory, etc.) in demonstrating bodywork techniques, addressing herbal and nutritional support, and spiritual and emotional support. Since our focus is to keep the balance, or restore it, in the abdominal cavity, the Arvigo® Techniques has a complete sequence that addresses the lower back, the sacral region and the hip’s balance, adding to the already complete abdominal work, a very thorough organic and holistic approach. The back work is what makes the treatment very special for many clients who only expect to have a “belly massage”. When you get your diploma we are going to be there for you with the opportunity to accomplish 25 case studies (which are a requirement to access the next level of education - Advanced Clinical Application) under the supervision of your mentor. Your mentor is one of your advanced teachers. The Mentor will dedicate quality time to help you embracing this new way of treating your clients with the mere goal to make you feel competent and confident. When you have attended a class you can propose your candidature to assist it. Assisting is a very precious gift: you will be included in the Teachers team, the teacher of records will give you some responsibilities in order to allow you to grow into your teaching skills and group facilitating role. You have the unique opportunity to reinforce your technique and you will be a valuable part of the class. You will be asked to communicate your goals so that the team will make it possible for you to reach them. Learning by being part of something very tangible and truly special. After graduation from the Professional Care Training you can access a private group of practitioners coming from everywhere around the globe and with different backgrounds, tapping in a valuable and resourceful container, that can help you deal with what your clients bring to you. This cohesive and like minded group of people is a very valuable gift that comes with this training. With your competence you will be inspiring many! The Arvigo® Institute is constantly updating a very valuable manual rich of information and tools. It is a comprehensive text where you can find most of your answers, and if you cannot find them, you can always ask your mentor or your fellow practitioners. These techniques have been inspired from the traditional Shamanic Healer Don Elijio Panti, located in Belize, Miss Hortence Robbins and many other rappresentatives of a traditional knowledge. Dr. Rosita Arvigo dedicated her life to be a bridge between this amazing intuitive knowledge and the western medical system. In her work she managed (and still does) to create a very effective and holistic sequence that respects and enhance this ancient and precious knowledge. Every year Dr. Rosita Arvigo and the Advanced Teachers meet in order to make sure that we all keep intact the knowledge so when you become part of it you are actually entering a much deeper and wider knowledge, supported by an untouched lineage.